Damon Ferrell Marbut devastates the notion of apology in poetry with a tender recklessness in Little Human Accidents, poems that examine a personal evolution of sexuality and identity while treating the unavoidable step towards adulthood like a punching bag, especially in his free flowing self reflexive poems like Mornings Like This and So What. [gravityforms action=”conditional” merge_tag=”The poems are very candid, conversational, sentimental at times and unapologetic and raw in many others. It’s an honest, no frills, no bells and whistles collection anyone can find something to relate to.” condition=”isnot” value=””]How is Writing In Your Genre Different from Others? Trust your drive and ability, but don’t otherwise think you know much at all. Damon Ferrell Marbut is a Southern novelist and poet. 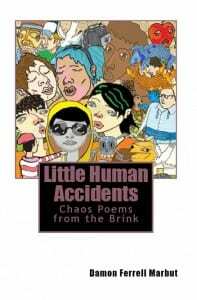 He is author of the acclaimed coming-of-age novel Awake in the Mad World and the collection of poetry Little Human Accidents: Chaos Poems From The Brink. He lives in New Orleans, Louisiana and currently has a new novel and new collection of poems under consideration with publishers. [gravityforms action=”conditional” merge_tag=”I wrote these poems as a documentation of the young writer’s lifestyle during years of graduate school, coming to terms with creativity, ambition and self-destruction. It was a beautiful, intense, important period in my history and my fellow writer friends’ histories.” condition=”isnot” value=””]What Inspired You to Write Your Book?